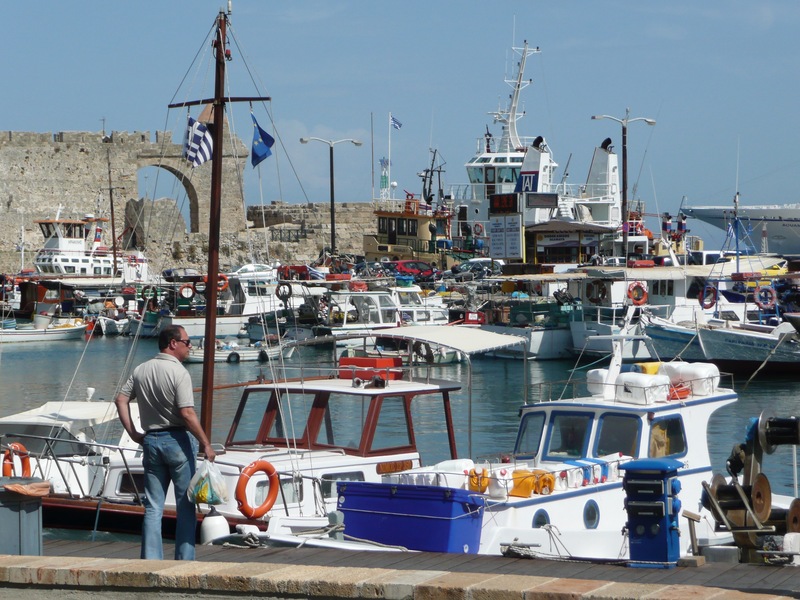 Mandraki Harbour, the alleged site of the Colossus of Rhodes has great atmosphere and is totally worth taking the time out for. This short 1 km walk takes just about an hour, and highlights some of the most important things to see. 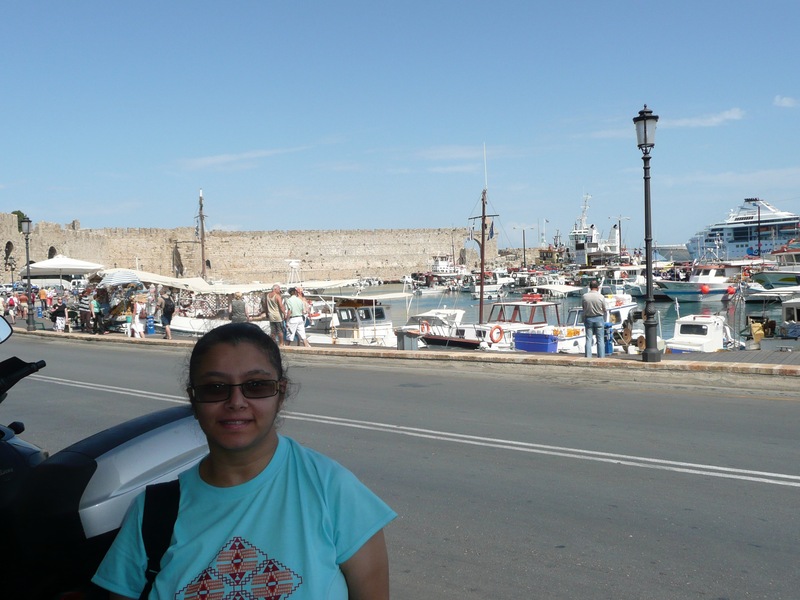 We start our walk at the Evangelismos Church, situated next to Mandraki Harbour. 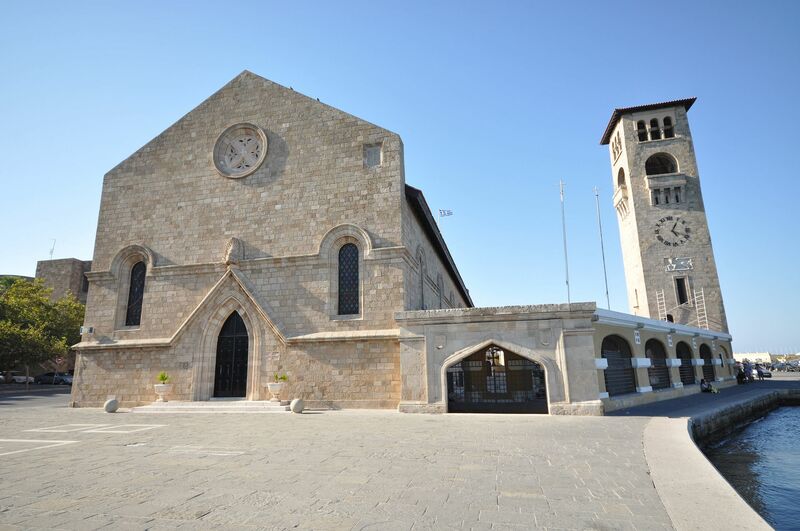 In 1925, the Italians were in control of Rhodes, and they built it as the Catholic Church of San Giovanni del Cavalieri, also called the Church of the Annunciation, Built by Florestano di Fausto and Rodolfo Petracco in the Gothic style, it was dedicated to St. John, and closely resembles the St. John church located in the Old Town. Look closely at the bell tower to see the lion of San Marco in a frieze about half way up. 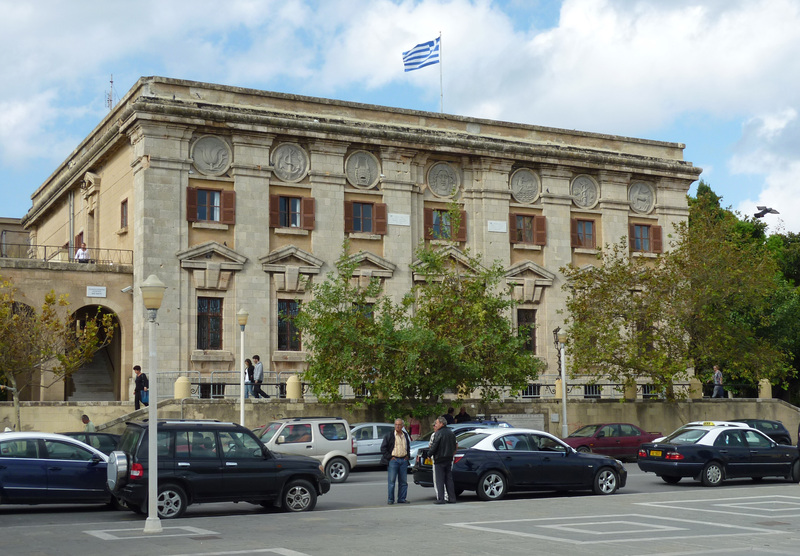 Next look at the Post Office, located in Plateia Eleftherias or Liberty Square. It was also designed by Florestano di Fausto during the Italian occupation of Rhodes. If you go further across the square, you will be in the New Town of Rhodes. For now, make your way to the New Market Hall, located opposite the harbour. 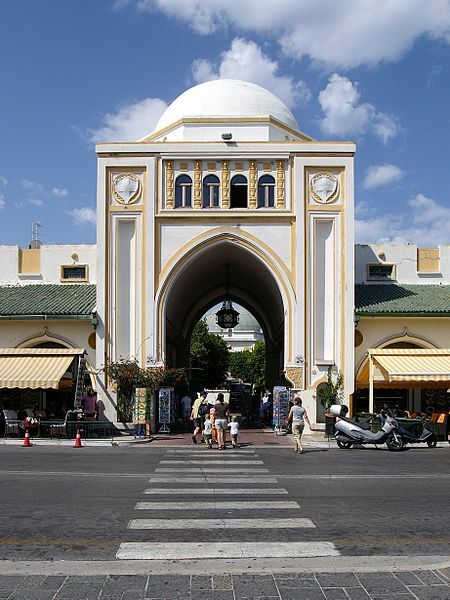 It a large building with a grand entrance, and houses many cafes and bars. The outdoor central courtyard used to be the site of the old fish market, and the gazebo suitably has fish decorations. The windmills of Mandraki can be seen on the long wave breaker of the harbour. 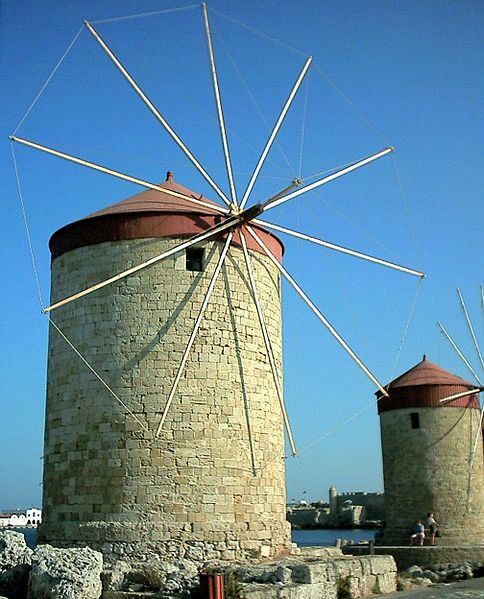 It is believed that originally there may have been upto 14 of these medieval windmills, used to ground the grain that came from the merchant vessels that docked in the harbor. Today, only three of these structures have been renovated and can be seen on the harbour front. St Nicolas Fortress looks out over Mandraki harbour. 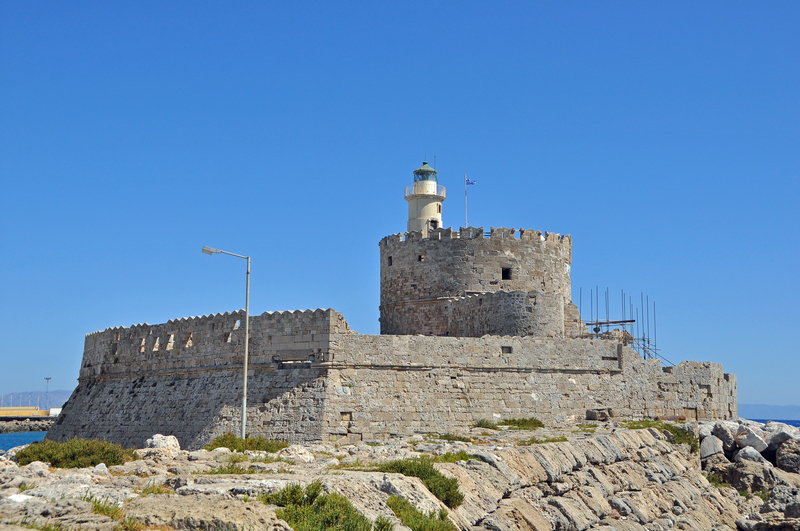 In the 15th century, a guard tower was constructed to watch over the harbor because it was a military space for the Knights Hospitallier who were based in Rhodes. On the orders of then Grand Master Raymond Zacosta, the tower was constructed and then further fortified with barracks and a bastion, which was named for the chapel inside as the St Nicolas Fortress. You can walk along the path of the former moat, which has been dried out. It is also the site of the lighthouse, which was originally constructed during the Otto man rule in 1863. The shite stone tower pulses once every 12 seconds. 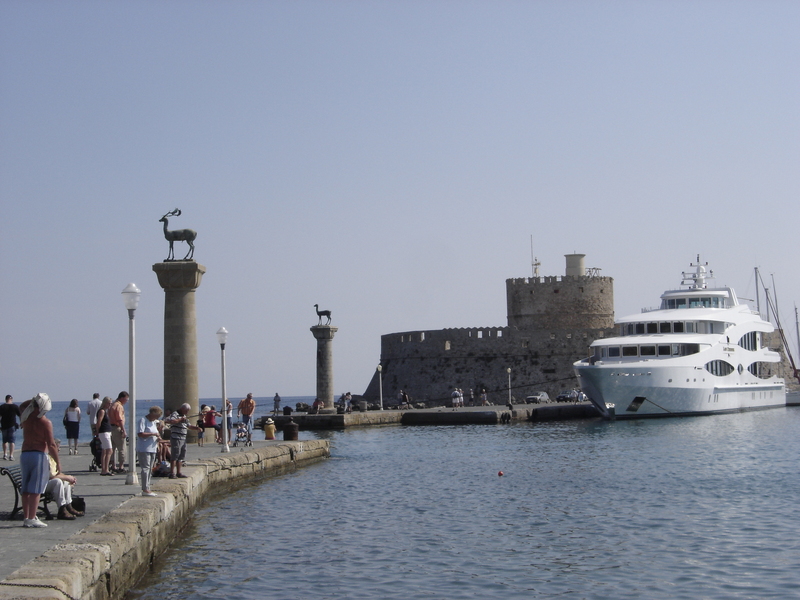 Finally at the entrance of the harbor, just about where the Colossus of Rhodes might once have stood, 2 slim columns stand as sentinels, topped with the bronze sculptures of deer. One is a hind called Elafos, and the other a doe called Elafina, and these are the heraldic symbols for Rhodes. 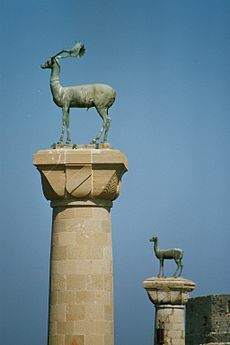 In ancient times, Rhodes was called Elafouissa which means “Lots of deer”. After your walk around the harbour, you can take one of the many boat trips on offer, either around the island or to the nearby islands of Symi or Chalki. Better yet, grab an ice-cream from one of the harbourside vendors, and sit on one of the many benches, and let the timeless magic of one of the most well known harbours of ancient times wash over you.